A projection of history depicting the fall of the Cretan Empire and the rise of Greek democracy in 1400 BC - involving a revolt led by groups of athletes in an ancient spectator sport, the Cretan 'circus of the bulls,' known as the "Bulldance." threatened to conquer most of Southern Europe. While there was no "monster" devouring youths and maidens in ancient times -- there is evidence of a "monstrous" gladiator sport in the Island-Nation of Crete - the Bulldance - which in effect would have "devoured" young athletes -boys and girls- sent as tax payments from smaller countries at the time. ...these "indentured athletes"- led by a group from Athens - would have faced a choice between their own survival and the birth of a new way of life -- the first middle-class movement -- and the first democracy in the ancient world, in 1400 BC. and finally to the Bronze Age Mediterranean, circa 1400 B.C. regarding the sacred value of every individual life to the whole of society. Where is the first evidence of a 'class movement' in ancient history? Where does the American Dream actually begin? The beginning of this middle-class movement can be traced back years before to a philosopher-prince called Theseus -- of Indo-European ancestry -- and a group of comrades from Athens, thought to be organizing the first craft guilds and free-markets for peasant farmers in the Attica region of Greece -- hoping to expand this to all the kingdoms of the Greek Mainland -- against the wishes of the ruling class. But this occurs at a time when the Island-Empire of Crete in the Mediterranean -- the dominant sea-power of the time -- was apparently considering conquest and expansion onto the Greek mainland, before it could unify and compete against them in the Asian trade. 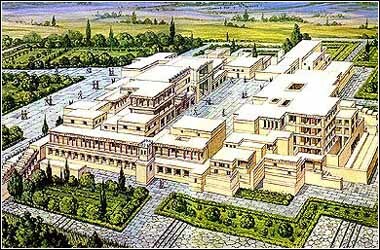 Legends suggest as a first step, a series of taxes were placed on the kingdoms of the Greek Mainland. It is believed Theseus and his friends were sent to the capital city of Knossos, Crete -- as tax payments to perform in the dangerous Cretan gladiator sport, the Bulldance -- presumably never to be heard from again. However, the young group not only survives -- but by making alliances with the athletes already there, and craftsman-trade factions within the Cretan government -- they are able to upset the Cretan plans for conquest, and return to Greece to start a democratic tradition at Athens. Later, beyond our story -- the ruling Myceneans were in fact driven out of power on the Greek Mainland. And though the country reverted to a "dark age" of regional conflict and strife soon after -- some elements of the democratic form survived in Athens until its full rejuvenation in the Classical, or Golden Age.....800 years later.